There's a kind of monumental quality at play here, the sort of essence you might not ascribe to this area or music too often, or want to, really. "contact" arrives with huge expectations. In terms of "pared-downed-ness", of the relentless stripping away of non-essential information, Rowe has been dealing with that for years, coming at it from one direction (and, too, bouncing back and forth between that notion and a flood of densely packed information) where Sachiko more or less began there and, if she's budged, it's only been a fraction of an inch, necessarily as there didn't seem to be very much more ground available to occupy. So the meeting of the pair, their first as a duo, has something of a mountaintop rendezvous about it resulting in both a stunning breadth of vision and a massive subjugation of ego. Of course, that latter idea gets paid lip service all the time; rarely do you hear it in practice to the degree encountered on "contact". They're not erased entirely--that possibility remains far off, I think--but "contact" comes closer than most. It's so vast--some two hours of unrelievedly patternless sounds--no real footholds proffered, making it extremely difficult to mentally encompass any of the four tracks, much less the whole thing, that a descriptive analysis seems pointless. I could say that for about half of "square"'s 41 minutes, Sachiko emits one pure sine tone, possibly adjusting the volume level now and then, perhaps not, maybe splitting the tone subtly toward the end of that stretch; it comes and goes after that. It's not so much a "background" for Rowe, more like a needle that pierces his every scrabble. (Who does what here, of course, is often guesswork, though idiosyncratic noises emerge throughout). As has been her practice in recent years, she doesn't move a hair and it's up to her collaborator(s) to fit in. Rowe does so perhaps more beautifully than anyone I've heard by using it as described above, not as a scrim against which to project his images but as a "solid" form on which to hang things, to adhere sounds, to pierce back in return. He's quiet (as is the sine tone) but hardly evanescent, active without being insistent, all scumbling sounds, small clicks, rough like sand but gentle like sand in its fine grainedness. I'm not at all sure the above description is of any value. If there's one overriding sensation I get from this release, it's of a natural process in action, maybe a geological one. I was reminded several times of Xenakis' great "Concret pH", where the hyper-amplified pockets of air within burning charcoal were captured as they microsonically exploded. Here, the pacing, the dispersal of sounds has something of that beautiful inhuman property, of a process that occurs for reasons other than human sensibility though, of course, that's exactly what it is. I said above that there's an extreme of egolessness here, and I think there is, but there's the contradiction, perhaps, of two clear sensibilities mingling, mindful of each other and their own contributions. For Rowe, it's almost an opposite attack from what we've heard on "The Room" or the live set from last fall with the classical samples. It's spare but by no means dainty. Graceful, yes, but by its own set of rules, I think taking his cue from Sachiko. Perhaps it stemmed from being in Tokyo (and the issues he dealt with in the live, solo set) but he seems to be almost deferential to Sachiko here, allowing her to set the terms initially, then engaging her rigorously but without any defensiveness. I think maybe it's Sachiko who's more "at home" in this world, Rowe who has to sublimate certain "classical" urges--arc, for instance--even more than usual. Inevitably, I think of visual analogies and, just as inevitably it's Twombly who first surfaces, the flyspeck scatterings slung across white space, the small clusters that form almost by chance (and when they do here, it's rather sublime), the balance wherein you have to mentally encompass a vast area wherein information is thinly distributed but voluminous, keeping it all in mind. Like I said, tough, tough, tough. Like some huge, abstract sumi painting where you can only take in a few square inches at once. As is, repeated listenings offer an endless source of newness, of guessed-at logics, of a language that I'm sure is a step or two beyond my grasp. I can easily imagine "contact" sounding just as imposing, if perhaps a tad more decipherable, ten years from now. "Living Time" was probably one of the first ten jazz albums I heard, I guess late '72? It was issued under Bill Evans' name, but even to my uneducated ears it was clear that it was really a George Russell recording. Russell, by then, was making use of rockish rhythms so it wasn't difficult music for me at the time, but it certainly sounded different from anything I'd heard. Within a few years, I'd read a bit about (but not understand) his Lydian Chromatic Theory--whatever, it gave his music a unique tinge. 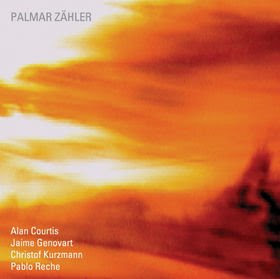 Pretty quickly, via NMDS, I ordered his epic "Electronic Sonata for Souls Loved by Nature" and the "Othello Ballet Suite", the former soon becoming a big favorite of mine, among other things my initial exposure to Jan Garbarek and his circle of musicians, which led to me getting their early ECM output. A bit later I picked up the phenomenal "Live at Beethoven Hall" set with Don Cherry (probably my favorite work of his, all told) and other earlier records. When I was in Boston in '74-'75 at the Museum School, Russell was teaching at the New England Conservatory so I was able to attend a couple of shows there--I think Stanton Davis was in his band then, probably others whose names I'd recognize today. My memories of the performances are vague but positive. In all honesty, I didn't care at all for much of the later music of his I heard; I recall being particularly disappointed by "The African Game". But his work through at least the mid-70s is marvelous. 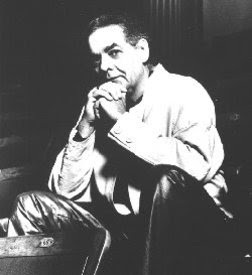 Many's the time I've turned on KCR in the middle of a piece and, even if I'd never heard it before, there was no doubt it was George Russell. Thanks for all the beautiful music, Mr. Russell. Not too often you come across something that just sounds like little else. 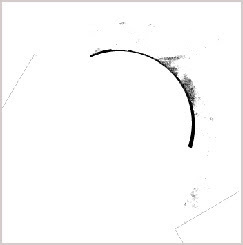 I suppose, stretching things, I could make a tenuous connection between Nehil and sometime collaborator Olivia Block insofar as a predilection toward certain hollow, echoey sounds and the general kind of construction in effect, but really, this stands apart. And it's very good. The first rack, "Tew" (so named, I take it, for the vocalized sounds that approximate the title), contains elements that might be kindling wood (or it might be watery in nature, sometimes hard to tell), various percussive tones both tonal and not, scattered irregularly but consistently, and the aforementioned, soft vocalizations, all but hidden. But there is a sense of composition here, of a carefully placed and layered sequence of three sound-zones that don't so much intermix as entwine. The "whuips" of "Whuip" are indeed whuiped like a, um, flock of cranes, arising here and there from another kind of percussion bed, pinned by deep, sizzling thuds and a ringing drone. Here, as in the first piece, the essential pace is very slow (even as some events flit by quickly), a twilight kind of atmosphere with distant rumbles, fireworks, parties. 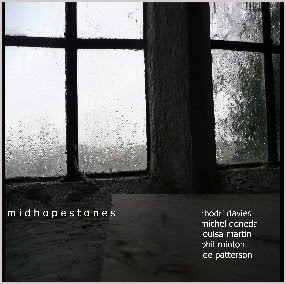 There's some wonderful clatter in other places, sounding like pool cues and wooden balls dropped in a large, resonant space, odd voices often present as though commenting on the delirious activity surrounding them (each piece contains its own nest of ideas, another impressive aspect of the disc). Highlights abound, including the marvelous and unexpected explosion of (all but indecipherable) lyricsal content in "The Sun" and the fantastic, Xenakis-like eruption of percussion in the concluding "Blackhole". If I had to pick, I'd say there are one or two moments when the dronage holds sway a bit long, but overall this is a fine and unique offering, do check it out. Yes, unfortunate title. And not so exciting music. 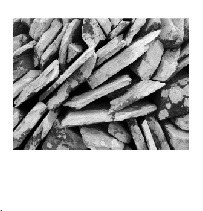 Shoemaker, like many others in recent times (too many) melds field recordings with ambient, drone-oriented music. In a way, it's a sure-fire combo, like hamburger and ketchup, but too often it's little more than that. Nothing offensive here--isolationist hums, several ply thick, bits of water, birdsong, etc. bleeding through the pores; attractive enough but I don't pick up a strong sense of purpose. There's an over-reliance on eeriness ("Hallucination Pool") that veers dangerously close to the corny in the way that Eno's "Apollo" series did. The title cut, though it begins portentously enough with some mournful tolls, by dispensing the melodic bedding to a great extent, works the best, edging into a bleak area that's convincing. I have only three more "F" LPs, so I wanted to get them out of the way! 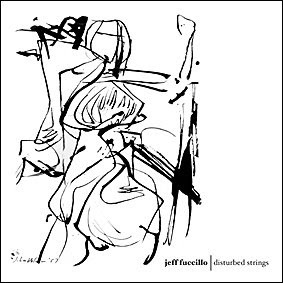 Jeff Fuccillo's "Disturbed Strings" is actually a recent one, from 2004, and I previously reviewed it at Bags (here). 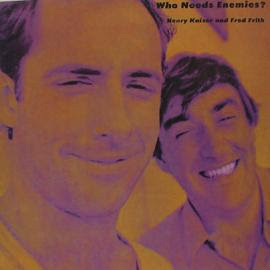 An unusual recording that includes tape interjections from John Fahey; this was intended to be a duo session and, much to Fucillo's surprise, that turned out to be the extent of Fahey's participation. I pretty much stand by the review and am pleased to report that the record stands the test of five years very well. Apparently (see here) it's sold out but it seems copies are somehow available (? not sure how that works). Well worth it for post-Fahey fans and post-Bailey guitar enthusiasts generally. Now here's one that I'd entirely anticipate not liking a tenth as much as I did when originally purchased around '87. Have Dossier LPs ever been released on disc? Fulton leads a band with Rachel Sherman (I've no idea what she does here, no instrumental credits are listed), Elliott Sharp, Wayne Horvitz, Bobby Previte and David Hofstra. I think I knew Fulton mostly as a drummer with Sharp and this is certainly a drum-driven album. At times, it has a rawness that still rings true, the kind of primitivism Sharp achieved early on with his first Carbon bands in the early 90s. Other times, it falls prey to the slickness that often infected Horvitz projects from the time, without the redeeming aspect of those occasionally luscious melodies. But overall, no, I'm afraid it doesn't hold up at all. Anyone know what became of Fulton? --a fully original repertoire which combines structured form and elaborate arrangements with soloistic performances by outstanding instrumentalists. All compositions are written by bandleader Maarten van Norden en [sic] co-leader Jan Kuiper. Presently, 'Future Shock' is one of the groups the most in demand and widely acclaimed in Holland. This record shows you why! Man. As if the LP title wasn't bad enough. So why do I have it? 'Cause it's Maarten van Norden, who was a monster tenor player with Breuker. I think this might have been his first return to record after the van accident he was in (the same one that killed Harry Miller) which, iirc, did serious damage to his jaw. Willem van Manen is on board as well, not that his own side project, Contraband, was ever more than a snooze. btw, not surprisingly, can't locate a cover image--pretty sure this was never discafied--but that's van Norden above; always a good looking fella. The music? Tightly arranged? Yes. Soloistic? I suppose. Boring? In extremis. Just a brief note as I'm writing it up for Squidco, but this is one of my favorite releases of the year. Stefano Scodanibbio leads and performs five pieces: Concert for Piano and Orchestra, Freeman Etudes n 1-5, Dream (an astonishingly beautiful piece I don't think I'd heard before), Ryoanji and a super strong performance of Radio Music. Check it out. The pages chosen were 53, 58, 168 & 169, the former pair containing some amount of calligraphic detail, the latter two consisting almost entirely of a the single "spine", though p. 168 has a small gap about a quarter of the way across the page. One reason for doing so was (is, as I'm writing this early on in the day) to try and tease out some of the differences in Keith's approach, not just when performing Treatise, but generally, with that of other contemporary improvisers. I've recently gotten more than ample tastes of that on the upcoming duo with Sachiko M (next week, Jon? [here now!]) but that's so...extreme, I thought this would be something more comparable to work being done in the fields by others. Comparable, but there's always something, many things, that set Keith's playing apart. Listening to a duo, I necessarily make some assumptions as to who's playing what, some of which may well be wrong. But I feel reasonably safe in saying that Oren's responsible for much of the underlying, beautifully modulated hum and probably some accompanying washes while Keith contributes the spikier portions. I know Keith has read circular forms in Treatise as indications to turn on his radio--there are two semicircles on p. 53 and a few full ones on p. 58, though these latter can also be read as variations on the repeat signs that appear throughout the score. I don't pick up any radio at all here, though it's possible he's tuned in to some between-station static. Assuming two pages per LP side (a possibly wuite unwarranted assumption), I also can't detect the page turning. There's a lot of wonderfully bristling static at the midway point on Side 1; if Ambarchi has done much of anything prior besides the drone (which has very subtle fluctuations and is fantastic on its own), I'm not sure; maybe his "role" has been spinal. Around this point, though, I think he expands his palette, maybe sticking with the darker lines of the score, ceding the lighter ones to Rowe. The play between the deeper tones and the rustly, papery ones (Rowe?) is excellent, really establishing a plastic sense of space between them. There's a decrescendo with a minute or two to go, perhaps the converging lines toward a couple of eighth notes near the end of p/58? 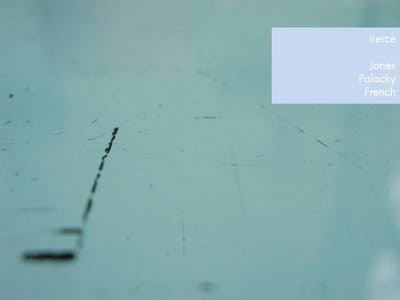 But the end of the first side consists of scratchy, crackling sounds (over a soft hum) where the remainder of the score has only a straight line and the number "1". Obviously, I'm entirely lost here. I'm rather sure Keith would be able to notate each section with some precision and that, in retrospect, I'd do a few headslaps, muttering, "Of course! ", but it's damned difficult to track otherwise. Also, as he's been performing this piece for some 44 years, there's been more than enough time for layer upon layer of intricacy in reading and understanding the score to have developed. Expecting to be able to easily glean what's going on in his head (and, in fairness, I hear this as more a Rowe-directed performance than a 50/50 collaboration; perhaps unfortunate but maybe unavoidable) is a fool's errand. As mentioned, pp. 168 & 169 are pretty much just the spine, with a single brief gap. Now, I have no idea, really, if the pages were performed in order or if they were laid out in any way sequentially rather than, say, played as overlays. Whatever, the music on Side 2 is hardly linear. Once again, Ambarchi lays down a bed, here more varied and granular than before, and Rowe injects harsh, rubbed sounds, quite rough, in the manner of many of his recent recordings and performances. One thought--the line in question is hand-drawn, after all and, examined closely enough, is full of small irregularities. Perhaps they're taking a microscopic journey along its truly bumpy path. There's a clear guitar twang a few minutes in--hard not to read that as the empty gap! A furious spray of chittering electronics ensues before things settle in, though not completely--it's calmer but there are five or six things occurring at most times. That's one active line. Dunno, maybe the last two pages take place in the final minute. But back to my original point. Granted Oren's contributions, Keith's interjections are just so right, so to the point (independent of my not being able to connect them with the score) in terms of timing, texture, dynamics and boldness. That latter, balanced with an innate sense of restraint and reticence, is what really makes it for me. The restraint insofar as not having to do anything, the boldness in feeling no compunction or constraint to hold back when an idea hits, the confidence in knowing one can place it within the ongoing context without its calling undue attention to itself at the expense of what's occurring in the room. If there's one quality in Keith's music that's rare to hear in others, it's that, for me. An intriguing smorgasbord that hits home a few times and just misses some others. Three of the six pieces are by Michael Pisaro, each a duo (violin/bass, violin/bass clarinet and bass/electronics). They're quite spare, often near unisons of held tones hovering in space. I found the first and second of only moderate interest but the third subtly wonderful, perhaps merely due to the instrumental combination, but it clicked far more forcefully and movingly for me. 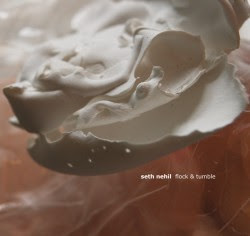 The two improvisations fare better, "Activation" an engaging mix of ethereal drones and everyday pops 'n' squeaks that remains solid and colorful throughout, "Decentring" a fine mesh of thin tones flitting past, the quartet again finding great variety in a fairly circumscribed area. 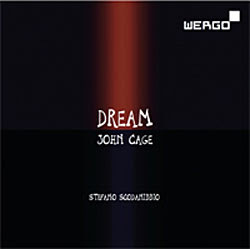 I've heard several versions of Cage's late "number" pieces; I don't have nearly a good understanding of them, I'm sure, but I've tended to enjoy them greatly. "Four6", presented here, is no exception. There's just a certain kind of openness in play, an unforced breadth, that makes it a joy to enter, each instrument really penetrating the aural space in a corporeal but delicate manner, like tendrils hanging from an eave. Really good work. Would have guessed, wrongly, that a session with Doneda and Minton present would turn into something more rambunctious. Restraint is the order of the day here, however, and it's an excellent day's work. There are actually only a handful of moments when you can recognize Minton; he blends amazingly well with the harp (e-bowed, pretty much), soprano sax, laptop and amplified objects. Mostly hushed with an great mix of textures, sandpapery to bell-like, sighed to gravelly. Nice, distant foghorn-y effects on the last cut, over whistled saxophone. Solid, mature in the best sense, well worth a listen. 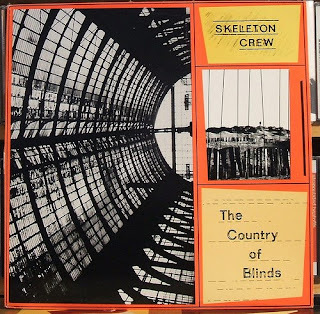 Simon has also released four more CDRs in his Byways series, meant to provide snapshots of the British scene, in these cases having been recorded in March and April of 2009. Percussion/violin in quiet, though very active mode. It stays in the area initially circumscribed, investigating intently, scratching away like furious termites for some 20 minutes before an "alarm bell" sound ushers in a second phase of gentle cymbal washes and softly plucked then more harshly sawn violin. This in turn settles into a small bed of muted bells, barely there drones and assorted chatter. I found the performance to get more engaging as it progressed, always a good thing, ending succinctly after about a half hour. I've been listening to these Byways discs a bit differently, trying more to psychically place myself in the live situation as opposed to hearing it as a "release". I can see being quite satisfied after this one. The excellently titled "Loiter Volcano" was a constant source of somewhat surprising pleasure the first time I listened. "Surprising" because the general attack leans a bit more toward efi (I suppose "post-efi" has been appropriate for a good while) than I normally care for. 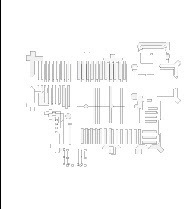 But this mix of electronics (that's printed here with a line through it--no idea why or how to reproduce it typographically), percussion and cello simply filled the space in a manner that held me rapt throughout. As with the other release featuring Dumont, it's partially about the textures and their creative deployment but, more, it's the structural fabric that emerges during the piece, the tensile strength one hears; there are no weak planks, each passage provides sure, if giddy, footing to the next. Whatever (non) electronics Abbott is wielding, he does so with great tact and Kanngiesser's cello, often residing in a semi-traditional zone, is a perfect foil, not lacking in emotion. 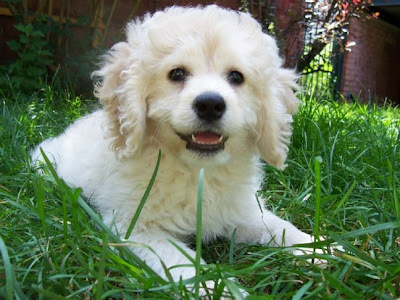 Loiter Volcano is my personal pick of this litter. I'm not quite as sanguine about this one, one track of which was recorded at the same event as the above. Trombone, electronics (sans disfigurement) and cello, the trio opts for a sparser, more irregular path, with perhaps a higher degree of difficulty. Two cuts, both emerging more or less unscathed, but somehow striking me as overly forced. Actually, it's a tough one for me to call; sometimes it has a searching quality that's very appealing, other times I hear it less as "searching" and more as "casting about". Again, I don't believe these are meant as statements or finished projects, more as snapshots; there's nothing here that would dissuade me from hoping to hear more from this trio by any means. I just wanted more rigor this time around. Eighty minutes of trumpet/electronics and alto sax. Here, the length works in its favor. An advantage, oddly, to listening at home (and reading the back of the sleeve): You know it's 80 minutes long so you "read" it as such, as it's happening, sitting back a bit, seeking a wider focus. Wright gets nicely strident here and there, Coleman generally staying with breath tones early on, getting more vociferous later, Kasyansky hither and yon (some well modulated radio), doing a fine job integrating and coloring. There's a break almost an hour in and one wouldn't have been surprised or disappointed had it ended there, but happily it does not, the ensuing 20 or so minutes taking on a kind of AMMish quality (replete with brief Sheryl Crow and "Blue Moon" captures), all subdued tension. Rather rare, that, after a relatively lengthy set. Good job. A quality set of releases; nice to get the documentation of the scene. I'm going to cheat a smidgen. I bought this album when it originally appeared, in 1974 or '75 I think, but it was purloined a few years later. Eventually I replaced it on disc and that's what I'm listening to now. I understand, post-AMM, that Frith doesn't come in for a lot of praise, at least as far as proto-EAI goes. Some of it's not quite his fault, ie, getting credited with many of the technical innovations actually created by Rowe simply by virtue of being far better known. Frith knew AMMMusic as a youth but the first time he actually saw Rowe perform was with People's Liberation Music in 1974 or so. Not what he expected and nary an extended technique to be seen! He maintains there was no direct copyage, that things like bowing the guitar, using alligator clips, etc. were "in the air" and I think it's reasonable to take him at his word. He never followed any real AMM-like aesthetic either, presumably another reason he tends to be ignored by eai folk. And, to be sure, his work was never so consistent, at least to the extent I was able to follow it. But there are nuggets to be found. As always, a large part of one's appreciation has to do with when one encounters a given artist. 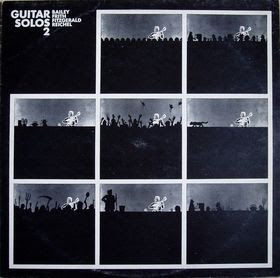 His first guitar solo album was also my first exposure to his work (not counting having heard some Henry Cow, I guess, in the record shop, but that didn't stick with me). It was quite a revelation. I knew Bailey already, though minimally (Music Improvisation Company and his duos with Braxton, I think that's all at the time) but that was probably as close as I came to this kind of playing, which is to say, not very. For that matter, I'm not sure if I'd heard a solo guitar record either. (? not that I can think of) He does sound fairly unique here--you can hear some Bailey, some Fripp, some Zoot Horn Rollo maybe, but I really don't think, plus or minus, there was much around like this in '75. If there's a certain clumsiness in play as compared to Rowe in AMM (though recall, at this moment, Keith was strumming away with PLM), there's also a kind of romantic beauty, a wistfulness in pieces like "Glass c/w Steel" and, especially, "No Birds" which, for this 21-year old listener, was a summa of experimentalism and knock-yer-socks-off bravura. It was certainly one of the key ear-opening records of my yout'. I think I picked this up in the Summer of '76. My copy has a circular green sticker on the front saying "Recommended Retail Price £1.59" so I'm guessing it was an import into the shop in Poughkeepsie where prog was king. Its noteworthiness for me isn't to be found in Frith's contributions (which are fine) but in Bailey. This would be my third exposure to him but the "purest" so far. It's one of those musical things I really kick myself for--I liked the three tracks very much but shortly fell into my "if it wasn't AACM-oriented avant jazz (or similar) I wasn't interested" period which included a general antipathy toward efi. I wouldn't really rediscover Bailey until his own Guitar Solos, vol. 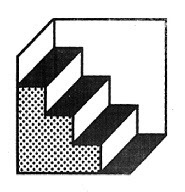 2 in 1990. Three beautiful, short, gentle pieces by Bailey here, though, including one with voice, "The Lost Chord" that's just fantastic. Frith's "Water/Struggle/The North" is actually quite good, maybe a step behind "No Birds" in solidity of conception though with a refreshing raggedness. Whatever became of G.F. Fitzgerald? I take it there's a 1970 LP, "Mouseproof" (review of that disc hereand a duo with Lol Coxhill from '75 here). From the evidence here, he sounds like a rockier Frith, scattered ideas not really coalescing. Tough not to smile when listening to this 1983 release, a collection of pop songs, more or less DIY with generic drum samples, (intentionally) cheap Casio tones, goofy vocals that nonetheless slide easily enough into the bitter (Some Clouds Don't [have a silver lining]", "Same Old Me", "One loving lick from a little pet dog can kill"). 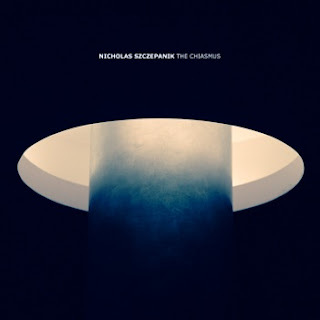 Not as slight an album as it might seem at first blush, very enjoyable to return to. I'm guessing this isn't held in very high regard by experimental music fans with an appreciation for acoustic blues. Kaiser's rep is pretty low (often deserved) and two white guys tackling Skip James amidst mid-80s, drum machine, fractured avant-rock; well, not a formula for critical success. But I think this was my first taste of James, albeit second-hand and, though I'm still woefully laggard in updating my acoustic blues knowledge, it did open the door a wee bit. Those two James tracks (Hard Time Killin' Floor Blues and Special Rider Blues) aren't really so bad; honest attempts anyway. The rest--well sometimes they're little machines that chug along ok ("The Golden Eighties"), other time Beefheartian takes ("One of Nature's Mistakes); not bad, but not so interesting today. Not sure why I have this filed here instead of "S" but because I like it so much, I'll play it anyway. 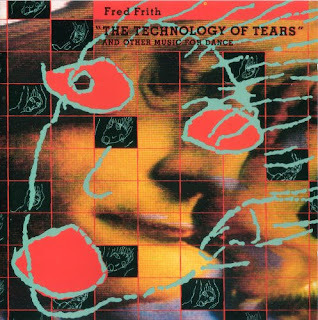 One of my favorite avant-rock albums of the 80s, Frith with Tom Cora and Zeena Parkins. Lot of risks here, sometimes totally over the top, often gorgeously lyrical, almost always bitter, bitter, bitter. And incisive. (I didn't realize until just now that "Man or Monkey" was a Cassiber album/tune? She made a man out of a monkey. Get down out of that tree! Great mix of extremely catchy songs, folk melodies and noise. Quite an explosion of imagination in this context, a wonderful record, possibly the best work I've heard from all three involved. Was never crazy about this one, from the 4th Victo festival in 1986. Still not. Way too much bravado, a lot of really aggravating vocalizing, drum machines, etc. Everything that was wrong with the extended prog scene in the 80s. Take it off. 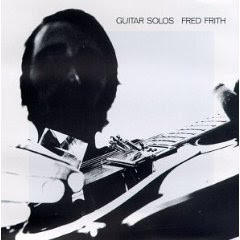 This was the last Frith LP I bought. I did continue to follow his work up to maybe 2000 or so (Pacifica, on Tzadik, which I liked, is the last I've heard). From 1987, it's two LPs. The first a quartet with Zorn, Tenko and Christian Marclay, though it often sounds like solo, overdubbed Frith. It's ok, some of it works, but there's a stiffness in play that, to me, plagued a lot of Frith's work from here on in. He's such a great melodic player, especially on violin, that the kind of rigid, almost martial rhythms and lines here just fall short. I recall liking this pretty much back when but this is a good example of something just not holding up. Between the basement tech of "Cheap at Half the Price" and, presumably, more recent digital work, this period sounds like a gawky adolescent. For the solo album, Skeleton Crew and other bits and pieces, I'm appreciative toward him. Thanks, Mr. Frith. 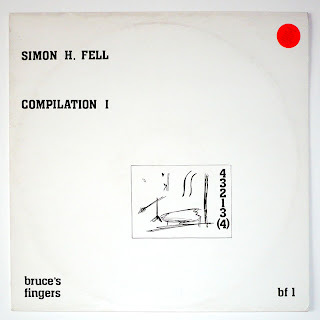 I'm guessing I read reviews of Fell's work in Cadence, maybe in early issues of the Wire, and was intrigued by comparisons to Braxton, Mingus, Stockhausen, etc. I think I picked these up after "II" was out, presumably around '92. Can't say I ever, erm, fell under his sway, at least in this guise. The proto-deconstructivist aesthetic at play just seems to me to be basically at odds with the black jazz experience at the heart of the music. It ends up being somewhat dessicated and astringent, a mouth-puckering experience instead of a saliva-generating one. Not that the latter was Fell's purpose; my recollection is that he was trying to apply strict serialist technique to jazz composition, among other things. Just seems like a quixotic idea; why invest that heavily in, say, Mingus, if you're only dealing in surface aspects of his work, not with the meat? Maybe it's just that, given much of the source inspiration, I'm unable to listen to it as "not-jazz". I should mention that I've enjoyed Fell's work very much in other contexts, notably the very first Erstwhile recording (Fell and Hession are both on Compilation II ) and the wonderful IST Trio which I had the good fortune to witness at Tonic, whereat Mr. Fell inflicted hitherto unseen-by-me tortures on his instrument (and parts of his own body, including using his left ear to fret the bass as well as bowing over his own hand atop the strings) that were mighty impressive. Here, there are certainly snatches where he eases up on the reins and lets the band more or less fly, though it always sounds as though constraints are in effect. Might it work better with other musicians? I'm not overly familiar with most of the band at hand; hard to say if better could have been had. 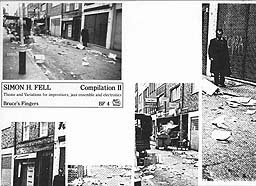 Compilation II is, largely, a definite improvement, far more full-sounding though still far, far short of real interest. The conception is healthier enough that I find myself dwelling less on its aridity and more on the shortcomings of the soloists! None of whom, with the exception of Fell, I find too compelling. Even so, it begins to dribble and drag after a decent start, the ghost echoes of the back-line sounding too contrived, the electronics too doodly. I'm sure I'm "listening wrongly" but it just doesn't do much for me. Of course, one of the fun things about surfing through one's vinyl like this is the juxtapositions that inevitably occur. 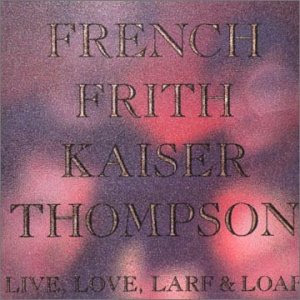 Here you have the hyper-serious Mr. Fell with an very complicated project that pretty much leaves me cold and right next door you have one of the avant's silliest supergroups, but I'll be damned if I don't enjoy "Live, Love, Larf & Loaf" a damned sight more. I didn't really know Richard Thompson from a hole in the ground when this came out and, honestly, my working knowledge of him has hardly improved in the meantime, but the other three were well-known quantities and, for their first effort (I repeat, for their first effort), they put together an enormously fun album chock full of solidly crafted, often quite amusing and imaginatively wrought pop songs. 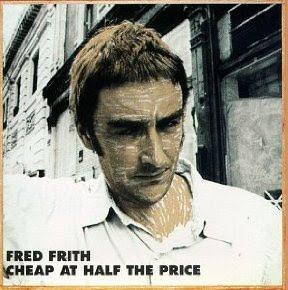 Frith's "Where's the Money" is one of the most sardonically bitter rock rants I know and to follow it with their extraordinarily goofy take on the Okinawan ditty, "Hai Sai Oji-San" is just inspired. Even "Surfin' USA' works. Thompson's faux sea-shanty dirges are an acquired taste, I guess, and I'm not sure I'd be so interested in hearing much more, but they fit just fine here. I think this was the first I'd heard French since Drumbo days, so that was an added thrill; if he's not so absurdly creative out from the Beefheartian umbrella, he's still perfectly serviceable. Good record, well worth checking out. I emphasized "first" above because the next one by this quartet, which appeared for some baffling reason on Windham Hill, might just possibly be the worst piece of crap ever to appear, however briefly, in my collection. I only retain vague, unsavory memories at this point (happily) but I know that, in fairness, I put it aside for a while and gave it a second taste. It remained retch-inducing. Man, was that foul. Have a couple of Ella Fitzgerald records but I've declined to spin them, no offense to her or her fans. Saw her in Paris, in 1983. Kinda fun. The Friths are another matter though, but they deserve their own post. 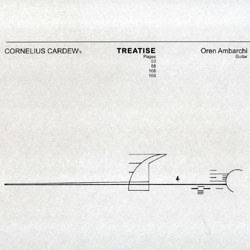 btw, I've picked up, and am listening to now for the third time, the Rowe/Ambarchi performance of four pages from Treatise that recently emerged on the Italian Planam label (LP), a set from February of this year. Mighty tasty. 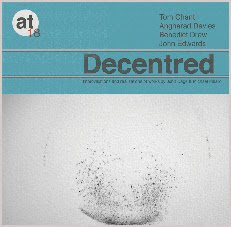 This disc is bracketed by two very brief but extremely loud and harsh bursts of electronic noise, as though Szczepanik was marking out territory for future use, even if the bulk of the music contained herein resides in the general area of complex dronage as heard in the work of Richard Garet, Asher and others, where there's often much more occurring than meets the ears at first blush. He'll intertwine textures that set each other off well (a rich hum with a scratchy, airy whoosh, say), underlie them with a pulse that's more sensed than heard and then elaborate the edges with other colors; these last are the ones it takes me a while to realize are there but, once picked up, add immensely to the overall picture. As ever, those choices are key. While always well-crafted, certain options can veer things toward the bland, as happens for me on "The Silhouettes of a Winter's Sunset". But by and large, Szczepanik skirts these dangers and fashions piece that are both immediately enticing and repay deeper listens. The final cut, "Lose Yourself...", by all rights should have been exhausted several minutes in but, at the end of its 19, I found myself still discovering new relationships between sound layers; can't ask for more. Curious to see where Szczepanik goes from here, especially given those two warning flares. Y.E.R.M.O. is Yannick Franck and Xavier Dubois (with additional drumming from Jason van Gulick. It's mastered by James Plotkin; I might not have thought of OLD without that prompt but once triggered, you can hear something of an affinity. Five tracks, though presented as a single work, it hits the ground running, pounding away like a roaring flood through a narrow tunnel, reverberating, scouring. In the third section, some acid-tinged guitar intrudes inevitably (for me!) summoning "An Index of Metals", but lending a more rockish air to the piece, the drums forming a more regular rhythm (á la Branca), something I'd rather not have had surface. A couple of times, it billows out into a less ruthless area, though still smoky and troubled. Not really my cuppa, but for aficionados of 90s Isolationism (with maybe a nod toward Godspeed!) and extensions thereof, Y.E.R.M.O. delivers the goods. Phil Begg weaves sounds derived from acoustic instruments and field recordings into a rather enchanting warp and weft. He uses many rubbed sounds, creaking door-type, layered into soft ringing, gentle water lapping, odd muffled buzzes like alarm clocks under a pillow and much more. He dwells overlong in some areas, as in a harmonium/water "duo" midway through, though the harmonium drone eventually seduces. Still, the complex interplay heard at the piece's inception isn't quite maintained throughout so that by the quiet birdsong at the end, I'd drifted away a bit. Which perhaps is intended. From the back cover, I expected something like a series of songs and, in a way, that's what it is, except that the songs are formulated from a recombination of field recordings in and around Zagreb and samples from various musics, local and otherwise, transformed into a cinematic kind of soundscape that recalled, for me, the work of Benjamin Lew, but with greater urgency. It's a fine line in this type of project between mere exoticism and unearthing some new connections but more often than not, I found myself buying into Maggi's concoction. He keeps his foot on the repetition pedal a bit long toward the end of the disc, finding a Riley-esque groove he enjoys, but the disc is overall a not unpleasant wallow. I'm increasingly at a loss for things to say about work like this, especially when I enjoy it, which I very much do in this case. Descriptions are inevitably feeble but simply observing that it somehow conjures up a situation, a place, a real or imagined environment and does so convincingly doesn't do justice either. I will say the trio (Jones, guitar, turntable, contact mic, objects, mixer; Palacky, Dopleta 180 amplified knitting machine (! 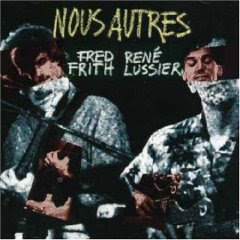 ); French, field recordings, guzheng, zither, objects) strike a delicate balance, managing to capture something of a field recording feel in their improvisations (certain taps, for instance, evoking the naturally irregular rhythms of water drops), that the performance tumbles along like a quiet stream over a complex bed. It's really, really good (a 3", by the way) and you should hear it. Interesting (if unfair) to compare to the above release; one of the same participants but solo, in a more purely field recording-oriented release (though French bows or otherwise touches various surfaces on three of the six tracks). Here, one's reaction I find often depends "simply" on how intriguing one finds the given sound-field in play. Even there, you're almost compelled to give a deeper listen if, initially, you're not so fascinated; often there's more at hand than you thought. The one unenhanced cut that I immediately loved was the fourth, "as030", which features a motor of some kind (I think), perhaps on a boat (sounds a little watery); it's strong, subtle and varies hugely within a narrow focus. The lengthy final track, the one on which bowing can most clearly be discerned, works pretty well also, a rich range of rubbing-induced groans. It might stagnate somewhat on disc due to its run-time, almost a half hour, but one can easily imagine wallowing it it with pleasure in an actual installation. It's a good disc, but the fine interaction heard in the trio recording puts that one well ahead for me. This, along with the subsequent disc, are the first two CD releases from the Russian label, Mikroton (after several MP3 issues). 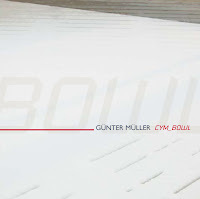 Müller, for this album, has processed a large amount of recordings derived from cymbals and singing bowls, molding and twisting them into a steady stream of vaguely cymballic sound. Listeners familiar with his work will have a reasonable idea what to expect: a pulse that's at least implied (often overt), a blurring of edges, a generally warm tone even at its most industrial. Fair enough, but there's something of a progression in play from the blandly attractive opener to the more troubling "Third Cym", where Müller manages to evoke more than mere sonic effects. Still, the overall tilt is toward the kind of relatively featureless, anonymous music he's been, more often than not, producing over the past few years; I always find myself yearning for someone to throw some sand in the gears. Kurzmann (lloopp, clarinet, voice) spends a good bit of time in South America and is here joined by several musicians from Buenos Aires: Courtis (homemade violin, contact mic, mp3, tapes, processing), Genovart (recording, synth, soft [sic]) and Reche (minidisc, ipod, alesis nanoverb, korg MS10). At its best, as on the second track where Kurzmann wields his clarinet (a crucial element in the whirling drone), the quartet creates a very rich swirl of thick, nodose textures with more than enough interior detail to satisfy. Kurzmann intoning "As Tears Go By" over threatening hums and rumbles works fairly well also. Elsewhere, they succumb somewhat to the homogeneous, if pleasant, kind of electronic improv often heard from For 4 Ears in recent times. Not bad but not special.